If you fire up a game for the first time without checking your graphics settings beforehand, you're not getting the most out of your graphics board. Whether your PC runs a discrete graphics card in a PCI Express slot or integrated graphics, your video drivers come with a control panel that you can use to make your games look better--if you know what you're doing. These control panels, unfortunately, are not easy to work with. Over the years, AMD, nVidia, and Intel have improved the user interfaces--but the underlying technology has also become more complex, and the control panels have gained many more settings to manage. If your system is powerful enough to run a typical 3D title above 90 or 100 frames per second, then it has excess GPU horsepower that you could use to improve the image quality of the game. Getting your machine to hit 60 frames per second while pumping up the graphics eye candy will make your overall gaming experience much better. The hard part is using trial and error--you change a setting, then play the game, then change again--to find the sweet spot, especially since every game and every system is a little different. My goal here is to give you some general guidelines for obtaining good image quality, as well as for finding the right blend of image quality and performance. Note that all of the following examples work with Windows 7. They'll likely work with Windows Vista too. Windows XP users, however, may see differences--and some capabilities (namely, features specific to DirectX 10 and 11) simply aren't available in XP. Before we dive into the intricacies of in-game settings and graphics control panels, it's worth discussing a few rules of thumb for prioritizing which settings to enable. Start optimizing your game performance via the in-game graphics control panels. The settings available in the game you're playing are often more optimized than the global settings you can enable with the AMD or nVidia control panel. As an example, if the game allows you to set antialiasing, use that setting rather than the Windows control panel setting. You'll often see better performance in the game, along with improved image quality. You may be tempted to start by cranking up the antialiasing. Sure, antialiasing removes annoying jaggies, but if you turn it on while the texture detail remains low, you'll end up with a muddy mess. Low-resolution textures will still look ugly with antialiasing turned on. 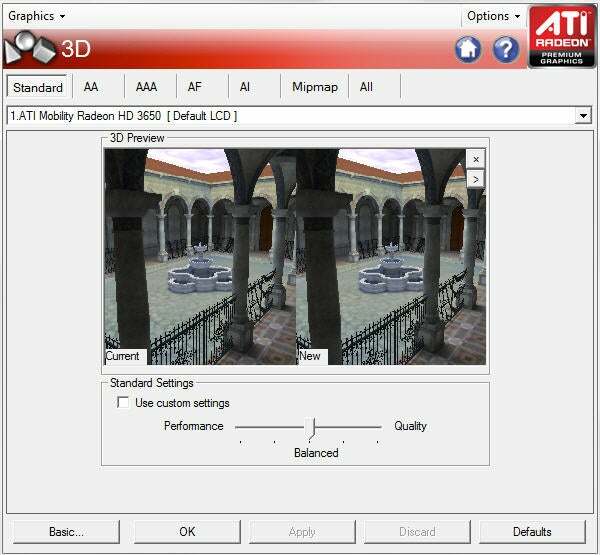 Anisotropic filtering with modern graphics cards can go as high as 16X with only a modest decrease in performance. Yet anisotropic filtering makes a huge impact in the look of the game as you move through the world, particularly with objects or textures that recede in the distance as you view them--you'll see less image popping, and long hallways and receding terrain will look smoother and more accurate. Sometimes, bumping up antialiasing will actually reduce the detail you see in the game. Antialiasing tends to soften what you see on screen slightly, and running antialiasing at relatively low resolutions can often produce a game world that looks a little blurry. That's a result of the color blending needed to create good antialiasing effects. If you're running a game at, say, 1440 by 900 with antialiasing, consider turning off antialiasing and bumping the resolution up to 1680 by 1050. The performance hit will be roughly the same, but you might see a little more game detail.